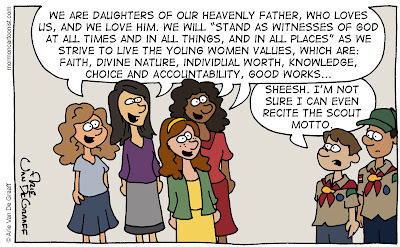 If you've every been in a Young Women's meeting or activity, you have a sense of how impressive it is to hear a group of Young Women recite the Young Women Theme. I remember complaining about how long Article of Faith #13 was. Somehow, I did memorize it. Back in the days of scripture masteries a couple of years ago, how could I ever forget the day I passed off Joseph Smith-History 1:15-20? It's nice just having doctrinal masteries in seminary now, more focus on DOCTRINE and WHERE TO FIND THE VERSE rather than mechanical repetition of every word. I was one of those people for whom that approach worked very well. Rote repetition was something I found to be incredible fun. I got to know the doctrine because I had repeated it over and over to remember it. 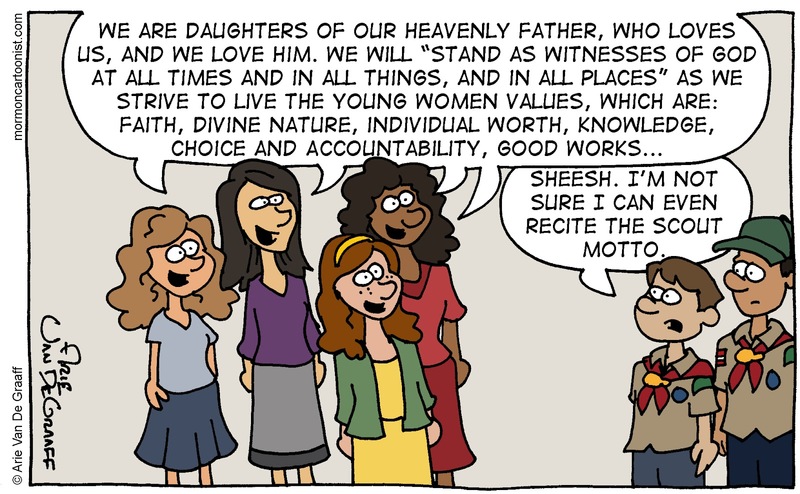 I don’t know how I’d do in the new program, but I do hope scripture mastery is still something that will be encouraged, even if it’s not required for passing. Although my daughter is inactive at the moment, it's amazing how well she still keeps to these principles. I’m also inactive. But the Gospel is my life. I guess you could say I’m active in one way. Just because I struggle to make it to Church doesn’t mean I’m not trying to keep the commandments.